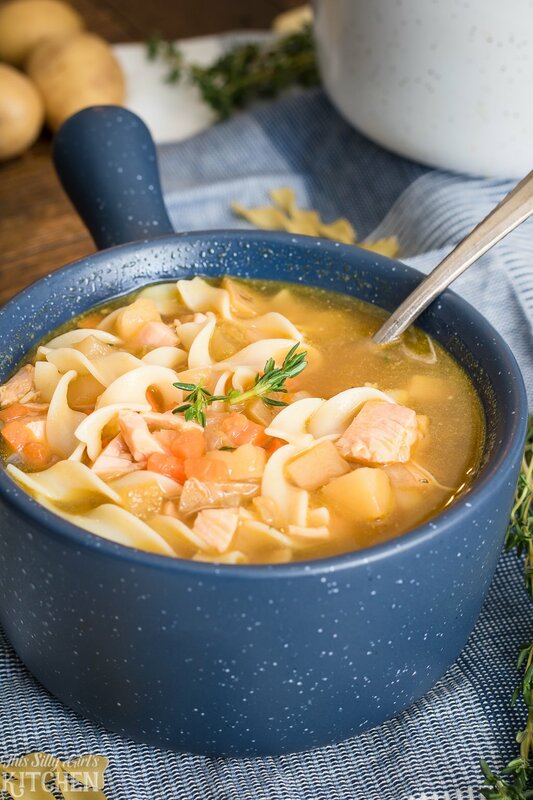 Rotisserie Chicken Noodle Soup, ready in 30 minutes and bursting with flavor! 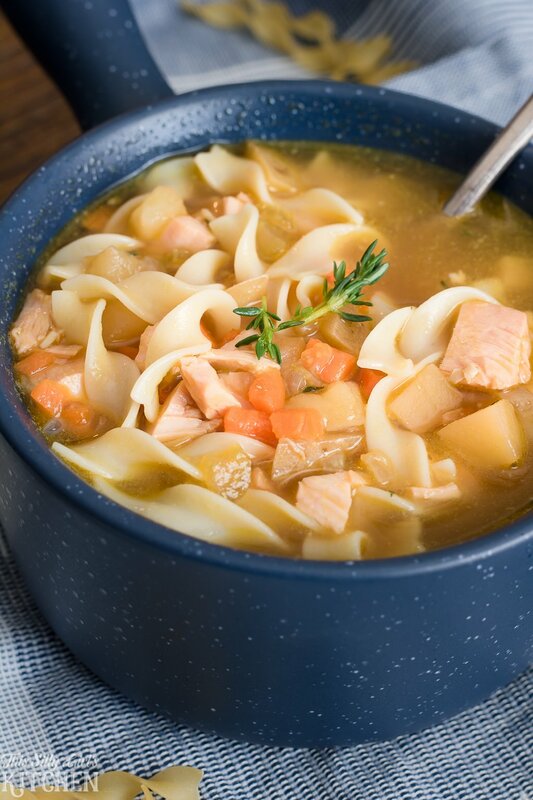 Rotisserie Chicken Noodle Soup, normally a time-consuming soup is made easy using store-bought rotisserie chicken. This post was sponsored by No Yolks as part of an Influencer Activation for Influence Central and all opinions expressed in my post are my own. It’s that time of year where I just want all the soups and stews and chilis and warm and comforting goodies! I absolutely love having a nice, warm, dish like this for lunch every day of the week! 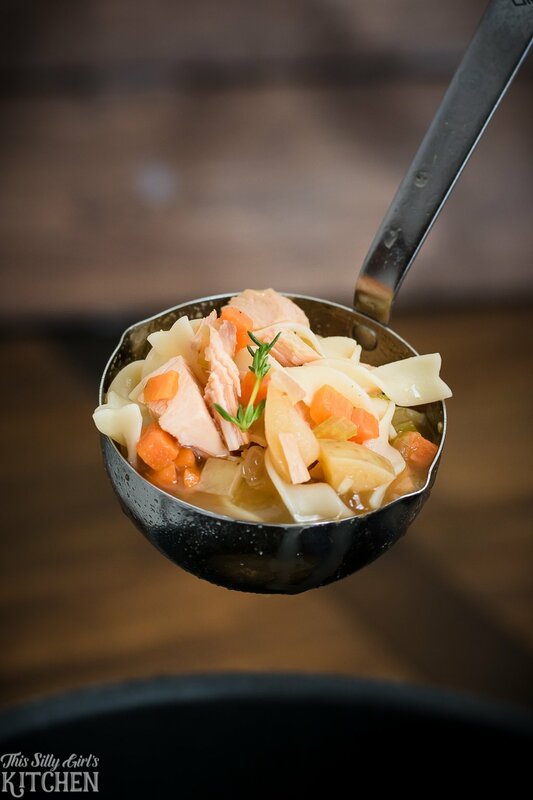 This soup is loaded with veggies, chicken, and of course, noodles! I used No Yolks noodles in mine because that’s just what I grew up on and what I’ve always used. No Yolks are comforting for me, not only are they delicious but they are a kitchen staple in my family. We use them in soups like this one, to casseroles or even as a bed for recipes like my Steakhouse Beef Tips with Noodles. What I love about them now as a grown-up is one, how versatile they are, and two that they are a healthy egg noddle alternative. No Yolks are made from egg whites, with no cholesterol, and are low in fat and sodium. For today’s chicken soup recipe, I cook the noodles separately from the soup so I can add them in right at the end, straight in the serving bowl. 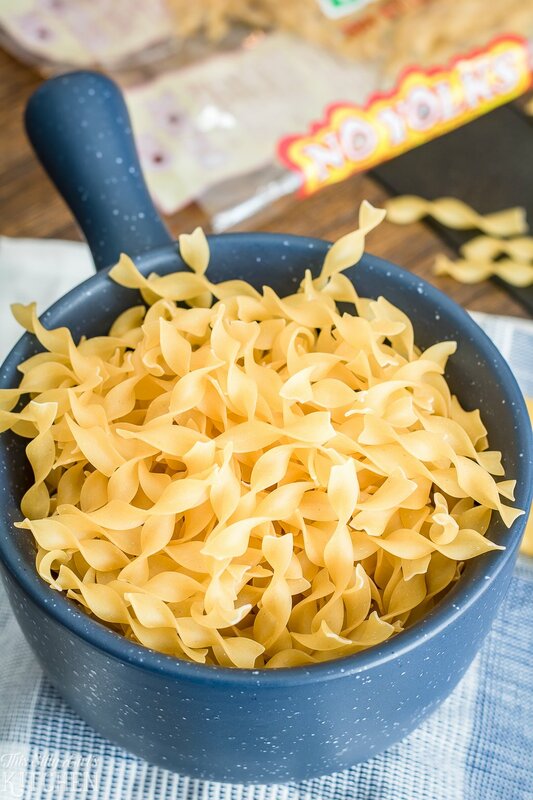 No Yolks are high-quality noodles that cook up smooth, firm and fluffy every time. 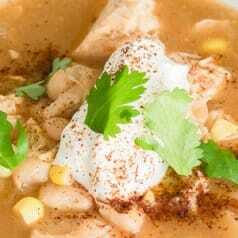 This soup recipe is so easy, anyone can make this! 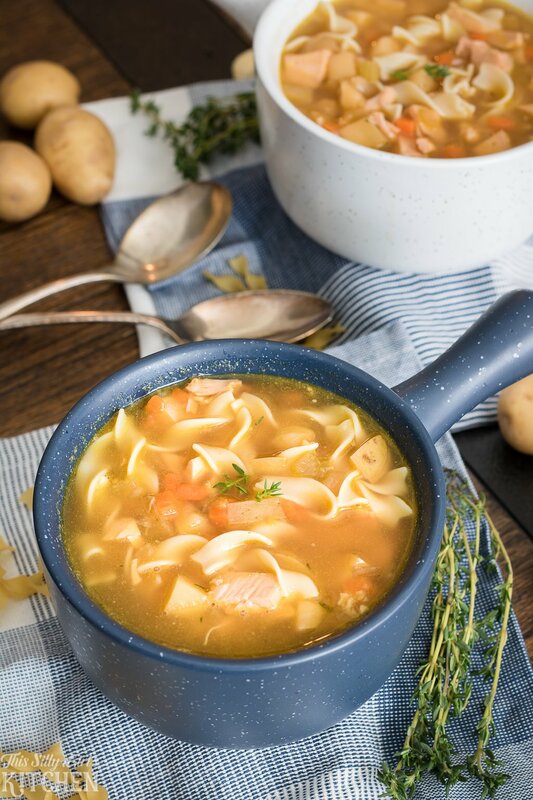 I really think this is a beginner level soup, but it is so good even the most seasoned cook will make it over and over again! Chop onion, celery, and carrot and sautee in a little olive oil over medium heat in a large pot. Add remaining ingredients including garlic, thyme, potatoes, chicken stock and diced rotisserie chicken. Simmer for 20 minutes, and serve with prepared No Yolks Broad noodles, that’s it! I don’t have a rotisserie chicken available, are there any alternatives? Yes! You can use any leftover chicken that you have, as long as there is not a heavy sauce on it. Any leftover roasted or baked chicken will work perfectly in this recipe! If you have raw chicken on hand, I suggest baking it until cooked through or you can even boil the chicken first in the stock for the soup, take it out, shred or dice it and add it back in the pot. Cooking any chicken for this recipe, will, of course, add more time on to the overall cook of the soup, so keep that in mind. 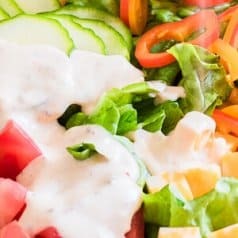 I like my soup loaded with veggies, any suggestions for added veg for this recipe? Oh yeah, try adding some small diced bell pepper, zucchini, or squash. Any beans, especially lentils, would go amazingly in it as well. Click here for $.50 off No Yolks! Between October 30th – November 15th, 2017, you have the opportunity to win one of 5 $100 gift cards! In a large pot, over medium heat, add the olive oil, onion, carrots, and celery. Sautee stirring occasionally for 3 minutes. Add the garlic and bay leaf, saute an additional 2 minutes until fragrant. Add the potato, thyme, chicken stock, bouillon, pepper, and chicken to the pot. Stir to combine. Bring to a boil, reduce to a simmer and simmer for 15-20 minutes or until the potatoes are cooked through. While the soup is simmering, prepare the No Yolks according to the back of the bag. To serve, add the desired amount of noodles to a bowl, add soup on top, stir to combine. 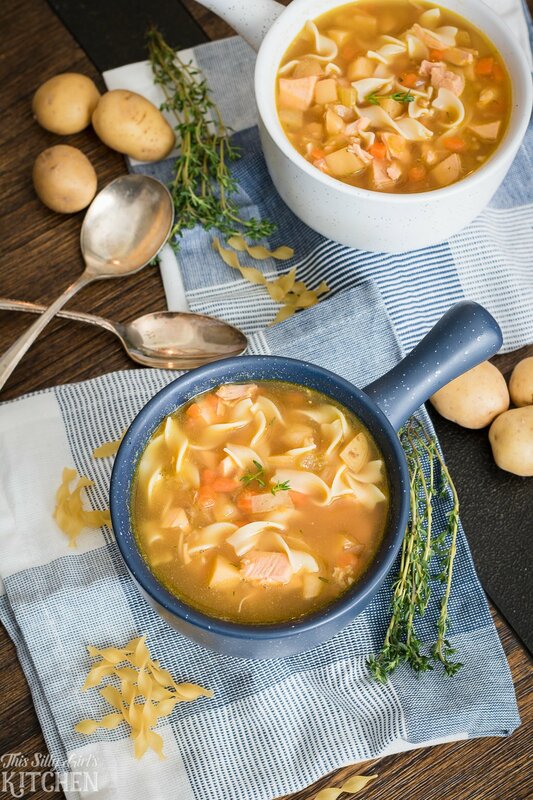 The weather is starting to get cold here and it’s the perfect time for soup! 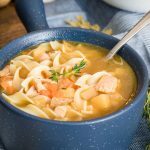 I love chicken noodle soup, and I’m sure this homemade version will be so much healthier and tastier. Nothing beats a good chicken noodle soup during the winter time. Pinning this for later!